Around 2,000 people protested in Dublin city centre as part of a campaign to get more Government action on the homeless crisis. It was organised by the Homeless and Housing Coalition, part of the Raise The Roof Campaign, which will be organising other protests, including planned events in Cork and Galway. Around 10,000 people attended the last protest by the group in Dublin in December. Today's protest consisted of marches starting at the GPO, City Hall, the Housing Agency, and Mount Street. Marchers converged at Customs House Quay and gathered at the Samuel Beckett bridge. One of the organisers, People Before Profit councillor Tina McVeigh, said housing should be made the number one issue at the local elections in May. She called on people to take part in upcoming protests in Cork on Monday and Galway on 8 April before the national Raise The Roof demonstration in Dublin on 11 May. It comes as the latest homeless figures show just under 10,000 people are living in emergency accommodation. The Homeless and Housing Coalition is supported by around 50 groups including local community groups, SIPTU and Fórsa unions, the Union of Students in Ireland, the National Women’s Council, the Irish Traveller Movement and homeless charities. It is also part of the Raise The Roof movement organised by ICTU, which is organising a campaign concentrating on a call to make housing a constitutional right. 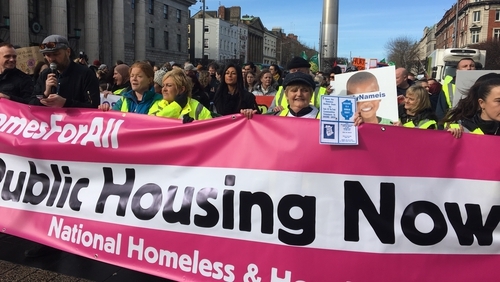 Both it and the Homeless and Housing Coalition are also calling for the Government to declare the housing crisis a national emergency, to end evictions and to build 10,000 social housing units a year.